In January 24, 1954, with grief and dispirited, she and the other Sisters and Brothers repatriated leaving their beloved Korean missions. Sr. Chrysostoma stayed in Bernried near Tutzing, helped to edit the ‘Missionechos’ magazine, and gave organ lessons to the postulants and novices. On May 10, 1956, some of the repatriated Korean missionary Sisters were sent to Korea, this time to South Korea, and she at the age of 65 wanted to be sent with this group. Her strong wish was granted since she recovered her health. The Daegu Diocesan Bishop Choi invited the Wonsan refugee Sisters to Daegu and thus, the Sisters found their new nest in Daegu, South Korea. As soon as she arrived at Daegu, Sr. Chrysostoma started to visit the refugee camps and poor neighborhood and taught the adults and children in God’s Word and catechism. She also visited the very sick patients in Daegu Fatima Hospital and nearby hospitals and administered the conditional baptism to the dying and critically ill. At convent, she translated the Latin prayer books and our Congregation’s history into Korean for the Korean Sisters. As the Korean situation got stressful again due to the North’s aggravation, the then Prioress, Mother Edeltrud Weist advised her to return to Germany with a German Sister who was then returning to Tutzing in 1968. Of course, for Sr Chrysostoma who loved Korea very much, it was a very hard decision but the precarious Korean situation and her old age made her leave Korea because she couldn’t cope with another war situation. Then, she started to knit sweaters and others for the war refugees in South Korea with the yarns that her relatives sent to her. She worked on them diligently and the pictures of them wearing her artifacts made her happy. She loved them so much. But her health grew weaker than ever and she was forced to be bedridden for a few months. Then on September 12, 1971, she passed away at around 4:30 p.m. Without Sr. Chrysostoma’s Wonsan Chronicles, today our ‘The History of Wonsan Priory’ couldn’t exist as a Book of our Priory’s beginnings. 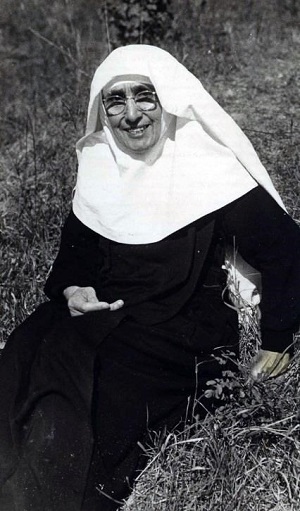 Sr. Chrysostoma had thoroughness and a clear spirit of responsibility and she was a true educator in many senses. We heartily thank Sr. Chrysostoma for all she had done for us Koreans and Daegu Priory.